Eos Like many of you I waste time looking for cars, this example popped up recently. My wife would love a convertible, however this strikes me as overpriced. Also, are these things remotely reliable? 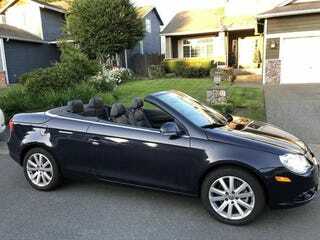 2007 VW EOS 2.0T, 65k miles, Thunder Blue on Titan Black leather. Premium plus Extended Warranty to 99,199 miles or 6/03/2019 (comprehensive coverage warranty) Luxury Package includes: Leather comfort seats, leather wrapped Multi-function steering wheel, Wood interior Trim, Rain Sensing Wipers, 6 Disc In Dash CD changer, Satellite Radio, 12 way power passenger seat with lumbar support, 17 inch alloy wheels with all season tires. 6 speed Automatic DSG shiftable Transmission: Park Distance Control: Special features: Roof, power retracting hardtop, fully automatic Panoramic Sunroof (pier glass), Wind blocker, Auxiliary music port. 200hp 207 lbs-ft torque, turbo charged in-line 4 cylinder direct injection engine Safety: Rollover protection, Dual front air bags, Latch key mounts for child seats, Tire pressure monitoring, Daytime running lights, Led Taillights, Anti- theft system, Immobilizer theft deterrent system, 23 MPG City, 31 MPG Highway Only 65,549 miles Local 2-owner car, sold new at Carter VW in Seattle New Pirelli P6 Four Seasons tires at 54,654 mile, and tire warranty for 45,000 miles. Dealer Serviced: full 60k service completed 60,158 miles. MSRP, hand book, spare keys, service history. Passed recent emissions test Premium plus Extended Warranty to 99,199 miles or 6/03/2019 Daughter is off to college out of State, need to sell.